Because it is a modern cosmopolitan society, in the present day all types of music can be found in the Canadian province of Quebec. Particular to this area are its traditional Quebecois songs, a local variety of Celtic music, and the traditional music of local First Nations and the Inuit. Quebec also has many well-known jazz musicians and a culture of classical music. Urban areas and summer festivals feature music and rhythms from around the world. Under French rule, what is now Quebec was called le Canada and was the most developed colony of New France. After some generations of French settlers being born in Canada, the colonists began to identify with their home country and call themselves les Canadiens (the Canadians) as distinct from les Français (the French), those native to France. A similar socio-cultural phenomenon occurred in Acadia, and other European colonies in America, Africa, Asia, and Oceania. The Canadiens brought with them a rich tradition of songs and dances from northern France, namely the regions of Île-de-France, Picardy, Normandy, Poitou, and Brittany. Influence from these regions, and the Irish immigration to Quebec of the 19th century may explain the Celtic connection that Quebec still shares with Brittany, Ireland, Scotland and the Maritimes. 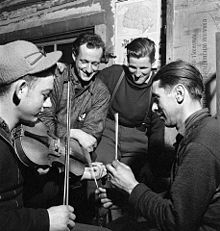 Québécois lumberjacks playing the fiddle, with sticks for percussion, in a lumber camp in 1943. Perhaps the most remarkable phenomenon in the popular music of that century was the career of La Bolduc, who became extremely popular singing satirical and sometimes racy songs based on the Quebec and Irish folk traditions, and who also was expert in the wordless vocalization known as turlutte. By the 1960s, radio and television had begun to help disseminate French folk songs, especially after the 1967 foundation of the Centennial Collection of Canadian Folk Songs, including recordings of Quebec performers like Yves Albert and Jacques Labrecque, as well as Acadian Edith Butler. The most popular songwriters and singers of this period were Gilles Vigneault, Leonard Cohen (attended McGill University, d.2016, buried in Montreal), and Félix Leclerc, who brought more influences to the music of France-based singing stars like Jacques Brel. Leclerc, from La Tuque, and Vigneault, from Natashquan in the north of Quebec, became heroes for a new generation of Quebec youth. It was Vigneault's "Mon pays" (My Country), which became a rallying anthem for Quebec nationalism after a 1965 performance by Monique Leyrac, and established a tradition of Quebec artists supporting Quebec's independence movement. Many artists openly endorsed it, notably Raymond Lévesque, Pauline Julien and Paul Piché. In the 1960s, the French Canadians of Quebec were beginning to self-identify as Québécois (Quebecers). See the Quiet Revolution. Another important nationalist performer during this period was Georges Dor, who enjoyed international success with his recording of his own composition, "La complainte de la Manic" ("The Ballad of Manicouagan"); other popular singers of the time include Claude Gauthier and Clemence Desrochers. Popular artists of the 70s included Harmonium, Offenbach, Plume Latraverse, Garolou and Beau Dommage, as well as Michel Rivard. Country music, in both french and english (primarily the former), is prevalent in Quebec. An aspect of the overall Canadian country scene, it is the chief source of francophone country, inclusive of artists such as Renée Martel, Gildor Roy, Patrick Norman, Willie Lamothe, and Georges Hamel. Progressive rock and fusion jazz band Maneige was founded in Quebec in 1972 by Alain Bergeron and Jérôme Langlois. The band was one of the Quebec progressive rock scene's longest running and most consistent bands. In 1974, Vigneault and Leclerc played on the Plains of Abraham with Robert Charlebois, who made heavy use of Quebec French in his rock and roll fusions. In 1976, multi-instrumentalist sisters Kate & Anna McGarrigle emerged on the international music scene with their blend of folk-rock and vocal harmonies added to self-penned songs in English and French, many of the latter co-written with Swiss-born poet Philippe Tatartcheff. The 1970s also saw roots performers like La Bottine Souriante gain critical and commercial acclaim within Quebec. Jim Corcoran and Bertrand Gosselin released La tête en gigue, an influential album that helped bring Quebec roots to crossover audiences across Canada, the United States and Europe. In addition to his musical career, Corcoran currently hosts a weekly show on CBC Radio One, which airs Francophone music from Quebec for English audiences across Canada. The early 1980s saw the formation of francophone synthpop/new wave groups such as Nudimension that became involved in the genesis of music video and MTV culture. More recent Quebec performers include Richard Desjardins, Daniel Boucher, Marie-Chantal Toupin, Éric Lapointe, Vilain Pingouin, Mes Aïeux, Les Trois Accords, Kaïn, Dumas, La Chicane, Les Colocs, Mélanie Renaud, Cindy Daniel, Daniel Bélanger, Paul Cargnello, Laurence Jalbert, Rudy Caya, Jean Leloup, Celine Dion (who had 4 No. 1 Billboard Hot 100 hits like "My Heart Will Go On" in 1998), Les Stups, La Chicane, Dan Bigras, Isabelle Boulay and more recently Cœur de pirate. Some bands, such as Les Cowboys Fringants have known success in Europe (primarily in France) while Karkwa, Vulgaires Machins, Les Batinses and Malajube are also recognized elsewhere in Canada and internationally. A hip-hop scene is also present in the Montreal area with groups like Loco Locass, Sans Pression, Dionysos, Criollo, Atach Tatuq, Manu Militari, KCLMNOP, Imposs, Muzion and Dubmatique. The metal scene is represented primarily by Sword, Voivod and death metal bands Cryptopsy, Kataklysm, Martyr, Neuraxis, Gorguts, Quo Vadis, Despised Icon, Ex Deo, Blackguard, Beneath the Massacre, Augury and many others. The Quebec black metal scene has also gotten some attention in recent years, including bands like Akitsa, Spirit of the Forest, Forteresse, Chasse-Galerie, Monarque and Nefastus Dies. In 2003, TVA began to broadcast Star Académie, a Québécois version of a French reality music competition, several new artists including Marie-Élaine Thibert, Marie-Mai, Émily Bégin and Stéphanie Lapointe became well-known music artists after their passage in the reality show. The tensions between Quebec and English Canada have, at times, played out on Quebec's music scene as well. In 1991, Céline Dion won the Félix award for Best Anglophone Artist for her English-language debut, Unison, but refused it as she did not view herself as an Anglophone artist. After the controversy caused by this incident, Dion has been careful not to clearly declare herself as either federalist or sovereigntist. Quebec has also produced a number of significant Anglophone artists, including Arcade Fire (who had 3 No. 1 albums on the Billboard 200 like The Suburbs in 2010.) Win Butler graduated from McGill University in Montreal in 2004. Régine Chassagne also went there. Patrick Watson, The Dears, Godspeed You! Black Emperor, Riverbeds, Stars, The Stills, The Unicorns, Wolf Parade, Rufus Wainwright, Sam Roberts, Paul Cargnello, We Are Wolves, The New Cities, Chromeo, Simple Plan and the infamous spoken-word musical career of William Shatner. In addition, some Quebec artists also included from the 1960s to the 1980s Lewis Furey, Men Without Hats, Norman Iceberg, Rational Youth, Corey Hart, Julie Masse, Martine St. Clair, Marjo, Offenbach, The Box, Gino Vannelli, Luba, Jacynthe, France Joli, Sass Jordan and Grimskunk, who have frequently recorded both English and French material. Quebec artists have dominated the long and short lists of the Polaris Music Prize. Among them, Arcade Fire, Patrick Watson, Godspeed You Black Emperor and Karkwa have all won the coveted award. Christian Roberge, lead singer of French-Canadian gypsy jazz band The Lost Fingers, performing at Festival Franco-Ontarien in Ottawa on 11 June 2009. Some famous jazz musicians from Quebec are Oscar Peterson, Paul Bley, Oliver Jones, Charles Biddle, Ranee Lee, Karen Young, and Alain Caron. The Montreal International Jazz Festival has been hosted by the city since 1980 and is now the largest jazz festival in the world, attracting huge crowds of visitors each summer, half of which come from outside the country. For the rest of the year, there is an Off festival that organizes jazz shows in bars all over Montreal. The early part of the 20th century saw growth in opera, and the foundation of the Montreal Opera Company in 1910, and opera singers became popular. André Gagnon, Angèle Dubeau, Michael Laucke, Louis Lortie, Alain Lefèvre, Alain Trudel, Alexandre Da Costa, Marc-André Hamelin, Nathalie Choquette and Richard Verreau are top classical musicians from Québec at the present. André Mathieu is among the most renowned composers from the province. He has been compared to a 'little Canadian Mozart', and Rachmaninov pronounced him, "a genius, more so than I am". His works became the official music of the Summer Olympics of 1976. Other famous composers are Claude Champagne, Calixa Lavallée, Pierre Mercure and composer-critic Alfred La Liberté, among others. Both nations have influenced each other in terms of music styles. In the last few years, Quebec singers have been taking the French stage quite extensively. Quebec singers that have performed in France included: Céline Dion, Garou, Anthony Kavanagh (a stand up comedian), Isabelle Boulay, Bruno Pelletier, Lynda Lemay, Cœur de pirate and many others. Roch Voisine and Natasha St-Pier are two artists who also perform in France and are often mistaken for Quebecers. They are actually from New Brunswick and are of Acadian heritage, like Daniel Lavoie who is from Manitoba. Few musicals were made or adapted by Quebec artists. Among them, Luc Plamondon has had the brightest career as a song writer, writing for the big ones (Céline Dion, Garou). The main musicals 'made in Quebec' : Starmania, La Légende de Jimmy, Notre-Dame-de-Paris, Chicago (adapted into French), "Demain matin, Montréal m'attend", Dracula. Cirque du Soleil has always developed its own musical pieces to go along with various acrobatic tricks. The music aspect of the shows is essential as it sets a mood to every single performance and links one number to another. Duguay, Raoul. Musiciens du Québec. Montréal: Éditions du Jour, 1971. N.B. : The emphasis is on "classical" then- contemporary composers and on those of "musique actuelle". Lasalle-Leduc, Annette. La Vie musicale au Canada français. Québec, Qué. : Ministère des Affaires culturelles, 1964. Lefebvre, Marie-Thérèse. La Création musicale des femmes du Québec. Montréal: Éditions du Remue-ménage, 1991. N.B. : Concerns women composers of Québec. Rodrigue, Patrick. "Rouyn-Noranda, la Mecque du rock 'n' roll" & "Un Musée du rock 'n' roll pourrait naître à Rouyn-Noranda", Abitibi-Express, vol. 1, no 44 (31 mai 2011), p. 4. N.B. : Paired ill. articles, each individually titled and separately accessible also on the newspaper's Internet site, describing Rouyn-Noranda as one of the two contrasting poles, the other being Montréal, of popular music in Québec. Sévigny, Jean-Pierre. Sierra Norteña: the Influence of Latin Music on the French-Canadian Popular Song and Dance Scene, Especially as Reflected in the Career of Alys Robi and the Pedagogy of Maurice Lacasse-Morenoff. Montréal: Productions Juke-Box, 1994. 13 p. N.B. Published text of a paper prepared for, and presented on, on 12 March 1994, the conference, Popular Music Music & Identity (Montréal, Qué., 12–13 March 1994), under the auspices of the Canadian Branch of the International Association for the Study of Popular Music. This page was last edited on 10 December 2018, at 06:03 (UTC).